In the aftermath of the Great Flood of ’13, Calgarians stampede to volunteer to clean up their city. Yesterday a call for the anticipated hundreds of helpers drew thousands of eager volunteers. Organizers and Canadians reel with wonder. The Heartbeat of the West. Our Slogan. Now it’s more than mere words, we’re living it. We always have but the Flood has thrust us onto the national stage. And there’s nothing like need to bring out our generosity. We’re fixers. We’re itching to roll up our sleeves and fix this problem. Our 101st annual party, the Calgary Stampede starts in nine days. It’s scramble time without the mess. Add a mess and the task is formidable! 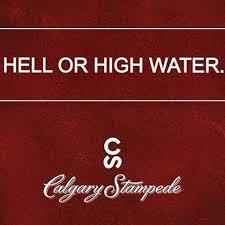 But in true pioneer passion, the chant is “Calgary Stampede, Come Hell or High Water”! I love it! Like the majority of Calgarians, this is my adopted home. I grew up in Red Deer a mere 150km away. From the moment I moved to Calgary, I have felt at home. One reason is Calgary’s entrepreneurial spirit; I identify with that. Another is our connection with nature, likely because of our proximity to the Rocky Mountains. Many Calgarians call themselves “outdoorsy”. Despite its antagonistic weather, more Calgary residents garden than in other cities. I tell people I can taste the “anything is possible” spirit in the air. Folks from the east often misunderstand this spirit. Sometimes we even receive vibes of jealousy and resentment from outsiders who can’t believe the stuff we can accomplish with our can-do attitude. Though I spent more years of my life in another city, this is my home. And I am so proud to be part of this family. Our parade may have to be rerouted and the Stampede may not be quite as shiny as usual, but the show will go on and we Calgarians will be raised to a higher level of consciousness. That’s what happens when you give until it hurts. Hell or High Water Indeed! This entry was posted in Blog and tagged Calgary Flood, Calgary Stampede, eager volunteers, entrepreneurial spirit, great flood, Hell or High Water, level of consciousness, red deer, true pioneer by Shelley Goldbeck. Bookmark the permalink.